If you would like us to pick up items from your home or business, please complete the form below to be added to our list. Pick ups are scheduled once per month (generally the last Tuesday) and we will contact you monthly to see if you have any items for pick up. We can only collect bags of soft goods or small items (such as childrens toys) at this time and service is limited to certain areas. We will confirm location and date of pick up. Frustrated with old clothes filling your closets? Don’t throw them out! Your donation of used clothes can help support Big Brothers Big Sisters programmes. 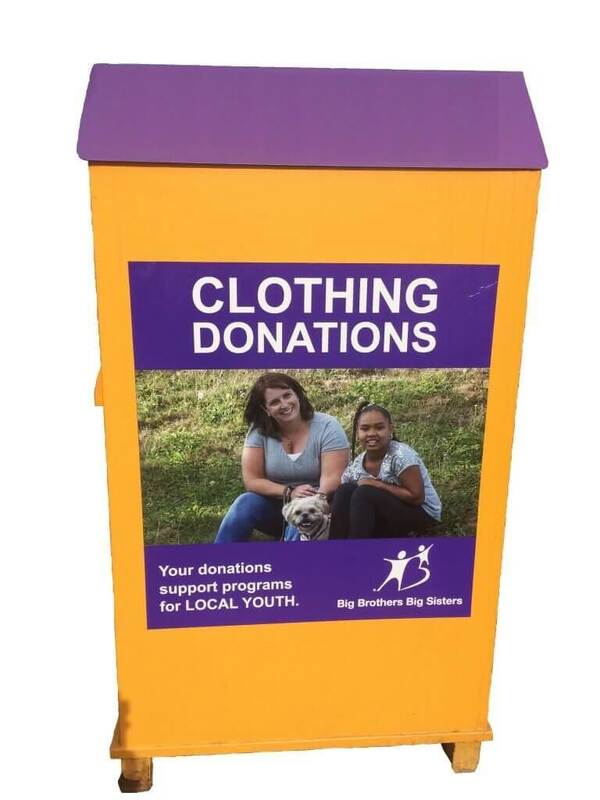 Every pound of used clothing donated to one of our bins or at the Value Village New Minas Community Donation Centre helps generate income for Big Brothers Big Sisters programmes. We’re able to do this thanks to the continued support of our amazing partners in the community. Funds raised through our Clothing Donation programme directly support Big Brothers Big Sisters programmes. In our bins we can take any clothing (mens, womens, childrens), shoes, hats, mittens, scarves, ties, socks, underwear, towels, sheets, and any other cloth materials. If you have other items you’d like to donate, you can take it directly to Value Village! They will also take books, magazines, records, CD’s, DVD’s, computer software, pots, pans, utensils, dishes, glassware, toasters, irons, blenders, stereos, and many other small household items. Please do not donate wet cloth or broken items. We also ask that you not place garbage in the donation bins. Disposing of these items costs money which leaves less for our programs. Thank you. Donation Locations that support BBBS programmes.